Wolf Driving School is keenly aware that in spite of the lousy economy, the transportation industry is doing astoundingly well. There’s always a need to transport food and other goods to stores across the nation. In addition, there are countless other reasons for persons living in Elgin to attend Wolf Driving School and take CDL Training to become truck drivers. First and foremost among those reasons would be the pay. Most truckers earn an average of $35,000 a year their first year out on the road. After a few years, those same drivers are averaging between $45,000 - $50,000 annually. Further, veteran drivers, who own their own rigs, average over $100,000 a year. There aren’t many professions that pay as well as that! 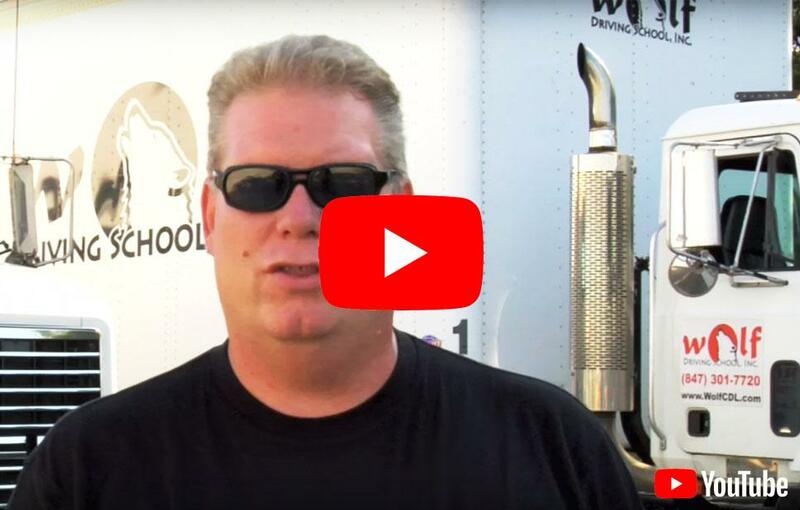 Wolf Driving School has been training Chicagoland and Elgin-based truck drivers to get their CDL training and truck driver training needed to pass the exams. As one of the most trusted truck driving/CDL driving schools in the Chicagoland area, we offer CDL Class A training (the highest possible truck licensing) with available training for additional endorsements such as: driving tankers, triples, passengers or hazardous materials. Our business is based upon the guiding principles of Honesty, Reliability, and Quality. You will also find our Wolf Driving School instructors to be highly trained and personable, and our equipment to be top of the line. Our CDL training and truck driver training schedules are designed to be flexible for our students, so they can work and study at the same time. We not only want them pass their exams, but we want them to be successful, safe, and confident behind the wheel. Elgin, Illinois is located roughly 40 miles northwest of downtown Chicago on the Fox River. Most of Elgin lies within Kane County with a portion in Cook County. As of the 2010, the city had a total population of 118,541, making it the eighth-largest city in Illinois and the 241st largest city in the United States. The median household income is $71,885. The median home price is $226,132. Elgin has an increasing need for CDL licensed truck drivers because of the sheer numbers of residents and businesses within the city. Most of Elgin’s perishables and consumer goods are brought into the city by trucks. Furthermore, the majority of goods made in the Elgin area are shipped across the state and the country via trucks. Consequently, there is always a growing need for new licensed truck drivers. Quite a few Elgin residents have recently signed up with the Wolf Driving School for CDL training/truck driving training classes. Having a CDL gives them the opportunity to embark upon a new career and to increase their earnings. If you are wondering why you should invest your time and energy into attending a CDL truck driving school, Wolf Driving School can provide you with the answers. Besides the pay, trucking is an opportunity to see some of this great country of ours. Want to explore America? Take CDL Training and Truck Driving Training and become a trucker! Truckers also know that their job is vital for the country. Without truck drivers, we would be in serious trouble when you realize that nearly 80% of our products are delivered by trucks. If you consider food, pharmaceuticals, electronics, etc., there’s an awfully good chance that they arrived by truck. Wolf Driving School will not only help you get a CDL; we’ll help you find a job. Call us today to begin the process of taking CDL training/truck driving training classes.